Barcelona Media Park covering more than 60,000 square metres of the old industrial district of Poblenou, is aimed at improving the international standing of the new media technologies of Barcelona and Catalonia as a whole, and to give it extra weight in terms of production, culture and research. It is intended as a catalyst for the varied elements that make up the industry, and seeks to generate the sufficient critical mass to attract major international projects. The Media Park entails �80m of investment. The complex is located in surroundings of improving urban quality and infrastructure that aims to act as a magnet for activities that are knowledge-intensive and have a high technology content, together with research and innovation facilities. The Park is a place for production and creation, and is open to all enterprises: those that are regarded as a 'driving force', smaller ones that are interested in being in close proximity with leading education centres and high-quality technical facilities, firms specialising in audiovisual genres, and professionals attracted by economies of scale resulting from the concentration of production facilities, support infrastructures and highly qualified human resources. The Barcelona Media Park project is promoted by Universitat Pompeu Fabra and the private company Mediacomplex and financed by the municipal company 22@ and the MEDIApro group. 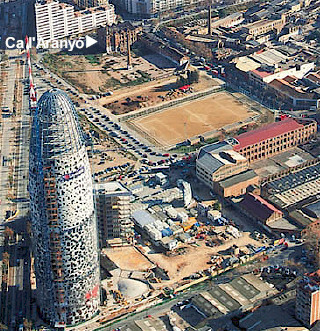 The Park occupies the site of the former textile factory Ca l'Arany�, on the block delimited by Avinguda Diagonal, Carrer Llacuna, Carrer Roc Boronat and Carrer T�nger. The Ca l'Arany� campus concentrates all Universitat Pompeu Fabra's facilities relating to teaching, research and production in the sphere of communication and technology, the studies in Audiovisual Communication, Journalism and Translation and Interpretation, the engineering degrees in Computer Science and Telecommunications, and the Audiovisual University Institute. The campus occupies around 25,000 square metres which includes a 2,000 square metres film set, other smaller sets, production and postproduction rooms, and a teleport for satellite transmission and reception. There is also an area of 5,000 square metres for research and production facilities intended for collaboration work between companies in the audiovisual industry and educational institutions. The architectural design involves rehabilitating two buildings of the old factory and constructing three new ones, with space for a total of 3,000 people. Building A: This building, overlooking Carrer Llacuna, has 3,000 sq m of floor space and housed the looms in the former Ca l'Arany� factory. It has been rehabilitated as the learning and research resources centre, complete with library, computer rooms and multimedia workshops. Building B: This building runs along Carrer T�nger, and was the warehouse in the old factory. Once rehabilitated, its 1,725 sq m of floor space houses the Audiovisual University Institute (IUA). Building C: New central building with 4,100 sq m of floor space. It includes the areas given over to teaching and research (lecture rooms, seminar rooms, lecturers' offices, meeting rooms) and a cafeteria. Alongside the building, the old brick chimney of the factory, built in the 1950s, has been retained. Building D: New building overlooking Carrer Roc Boronat. Its 5,500 sq m of floor space contains the departments and administrative offices. Building E: New building overlooking Carrer Roc Boronat. It has 3,600 square metres of floor space and contains the Universitat Pompeu Fabra Foundation and areas intended for companies operating in the audiovisual industry. Also included in the project is the leasing out of a total of 5,000 square metres of film sets and technical facilities (editing rooms and cutting rooms) built in the area managed by Mediacomplex. The new audiovisual production centre mainly consists of areas for audiovisual production, office space, teaching, audiovisual research, and ancillary services, on a site with a surface area of 6,782 square metres. The floor space of the centre totals 24,000 square metres. The project includes two slim towers of different heights, set perpendicular to Avinguda Diagonal and connected by a transparent box. At the level of Avinguda Diagonal, these two towers form large diaphanous porches, ten metres in height, that provide a prolongation of Carrer Bol�via and access to both the entry lobby to the offices and the area of the public cafeteria located in the first basement. Separated from the office blocks by the prolongation of Carrer Bol�via, there are the production areas, in the form of a parallelepiped box raised on columns and covered with a roof, showing a characteristic volume that is reminiscent of the numerous industries of El Poblenou. This huge prism is crossed by a glazed street that connects the main entrance on Avinguda Diagonal with the Universitat Pompeu Fabra communication campus. The volume of this complex of buildings is determined by their use. There are two principal structures. The first contains the three film sets. The main set covers almost 2,000 sq m and dictates the height of the building, which also includes the medium-sized set, covering 600 sq m, and a smaller one measuring 275 sq m, plus two additional levels on top of the sets, containing production areas. The second main building contains a storage area on the ground floor and two production areas above this, forming an extension of the main structure of the former Ca l�Arany� factory and respecting its volume and height. It also houses an auditorium that is open to the public, with a large entrance hall for access from Avinguda Diagonal. The underground levels have been set aside for a two-storey car park with spaces for nearly 550 vehicles, accessed from Carrer Roc Boronat. The creation of the Activities District 22@ is based on the process of transformation of the old industrial area of Poblenou into a district for new-generation activities. These include the new information and communication technologies, research, design, culture, and in general all those activities that characterise the knowledge society. The new media industry is a strategic option for the city of Barcelona, both for its economic dynamism and for its cultural interest. By its very nature it brings together companies with a high technological value and creators of innovative content, thus encouraging the development of talent and generating jobs with a high added value. The audiovisual industry is one of the sectors with most possibilities for future growth as it acts as a catalyst for a whole range of emerging sectors of the economy (mass media, advertising, information technology, telecommunications, consumer electronics, interactive multimedia applications, publishing, etc.) and numerous artistic and cultural manifestations such as theatre, music and the sector of knowledge technologies. On an international level, there are some good examples of centres that combine research, production and exhibition facilities and that exert a great deal of influence on the industrial activity of their surrounding area: the Zentrum fur Kunst und Medientechnologie in Karlsruhe, the Ars Electronica Center in Linz, the Institut National de l'Audiovisuel in Paris, the Sony Center in Berlin, the Sundance Institute in Salt Lake City, and the National Museum of Photography, Film and Television in Bradford, among others. Ongoing training activities, carried out in the facility itself and accredited by an authorised training centre. Activities aimed at disseminating new technologies. Private production activities related to training in the field of the information and communication technologies (ICT), using up to one-third of the total floor space of the facility. The space will be adjudicated to each company as a leasehold, the facility remaining under public ownership.